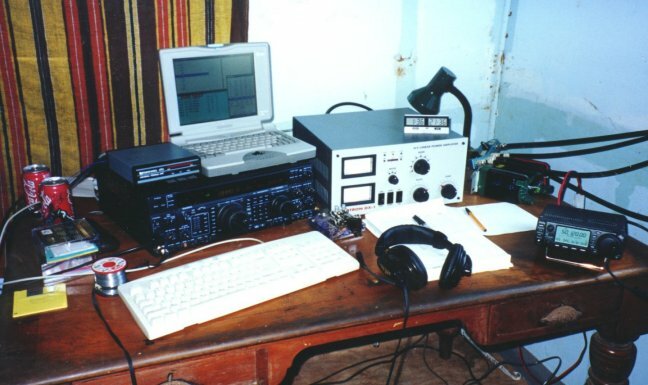 VP6BR radio shack with the FT1000MP, RTTY interface and the computer. On the right is the Emtron DX-1 HF amplifier and the IC706 MK11 radio for 6 meters. I feel very relaxed and happy as I soon arrive in Auckland ZL1. I left Pitcairn eight days ago on Sunday morning on April 23. During the first night the sea was rolling the big container ship Melbourne Star from port to starboard and back so vigorously that I had to stand up in the middle of the night to remove my FT-1000MP off the desk of the radio room and place it on the floor. Otherwise it could have dropped and been damaged. I could not sleep that night as I was holding the sides of my bed to stop my body from rolling. The second night was better and the voyage was improving day by day. It is getting still better as in one hour I shall meet my XYL Loretta who undertook the long flight from Helsinki to Auckland just to meet me as soon as the VP6BR Pitcairn DXpedition may be considered accomplished. By the way, the ship's radio room was already occupied by a ham operator. Ben W1VEH from the state of Maine embarked the Melbourne Star in Philadelphia, PA, and is on a roundtrip with his XYL and TS-140S. We soon found a common language and Ben allowed me to use his 20 m dipole. He kept his skeds with friends back home very early in the morning and late afternoon wheras I used the late evening hours to meet my friends and pass some home traffic through. Ben and I watched the Team Finlandia PJ9W 1990 CQWW Contest video and ZL9CI video which I had taken with me. Ham radio was present even during this eight-day voyage. 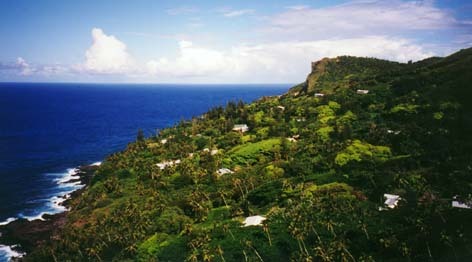 But what about VP6BR Pitcairn DXpedition? Did I meet my goals and was everything as good as I had hoped for? It is now proper time, indeed, to look back and evaluate the DXpedition as the memories are still very fresh. Jukka VP6BR/OH2BR presents the pennant of the SRAL to his hosts Betty VP6YL and Tom VP6TC. In the background is the rugged skyline in the are of Fletcher Christian's Cave. You can see the 6 meter yagi in its new locatuib at Tom's QTH. After the three-month long VP6BR DXpedition one could ask the question: what is the optimum duration for a DXpedition to a rare location? Is it two weeks or two months? Well, the pileups were there when I left so probably I should have not left at all. Consequently, at least in my case, the longer the duration the better. But frankly, I was morally and physically ready to move on. There was, in fact, some concern among the local hams about their attraction after my operation but after visiting the bands they soon realized that there still is quite a demand for VP6 even after my 56,000 QSOs so they became more relaxed. On the contrary, they will be more active on the bands to keep up the profile of the resident hams. As a benefit from my DXpedition, the Pitcairn ARC now has 2 new HF yagis, the A3S and A3WS with all accessories, so signals from VP6PAC should be great on 20 and 17m through 10m. You probably never can work down the pileups from any location but you simply move to another layer of hams in terms of power, antennas and interest to DXing. Last days of my operation were spent in giving out contacts to many stations with only a few watts output power and simple whip or dipole antennas. 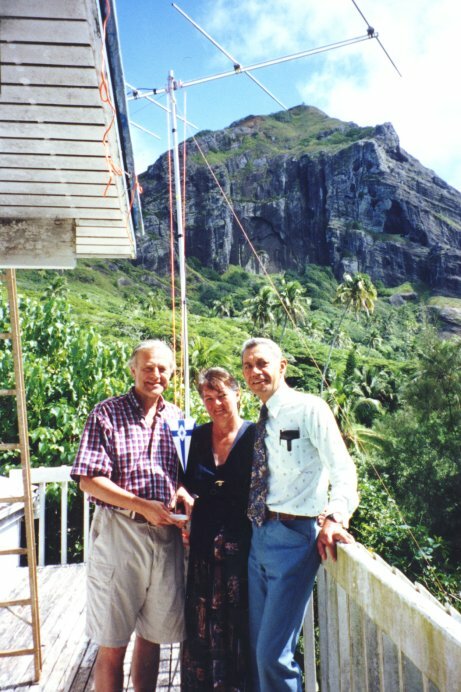 Astonishingly many of them did not know anything of the VP6BR DXpedition - well, frequently they did not know anything of Pitcairn Island at all. Was it the fourth or fifth layer already? My goal was to give every DXer a fair chance to work me at least once and the top DXers a real chance to make it on all bands and modes from 6 to 160 or at least on 10 to 160 m. Only few people reached this but everybody I talked to seemed to be equally happy for his contacts with VP6BR nothwithstanding the number of the QSOs. Perhaps some were encouraged to put up a new antenna for one of the many bands just to reach out to Pitcairn once more. If so, I am very happy to be the reason for such a station improvement. Of course, I knew that the sunspot maximum was expected to be present during my DXpedition so the excellent propagation should not have come as a surprise to me. Nevertheless, it did surprise me how well the bands were open to all continents with good signal strengths. The only bands to suffer from my location near the Equator and the sunspot maximum should have been the Top Band (160) and eighty metre bands. What I did not expect was ten and twelve metres to open practically every morning to Europe for many hours with good signals. Also I did not expect to work any serious EU pileups on 160 and 80 but, to my great surprise, the signals appeared at the respective sunrise times from the noise and climbed to a respectable S9 on the S meter, sometimes 20 dB over S9, thus enabling us to exchange reports on SSB. The window was not large, only from five to ten minutes, but as the grayline sweeped across Europe I enjoyed low band DXing at its best for two whole hours. Dupes were only 3.4% of the total QSO count but without active rejecting of dupe QSOs they would have been estimated at 15%. The dupe percentace is really low considering the fact that I participated in four major contests during my DXpedition (CQ 160 m, ARRL DX Contest SSB/CW and CQ WPX SSB Contest). The Top Band produced strong emotional moments during the DXpedition even at sunspot maximum. Who could have predicted that Europe would have been so strong on Pitcairn?! Certainly, if somebody had told me that I could work VP6 from Israel and Sweden on 160 m with S9 signals would have seen me smiling - do not fool me, please! But it happened many times and each time it was a miracle. 4X4DK and 4X4NJ made the longest distance QSOs on 160 m and, curiously enough, even in faraway Finland VP6BR was heard once (by OH1XX). But, unfortunately there was no two-way OH-VP6 QSO made this time. The Italians were the winners with S9+10…20 dB signals and armchair copy on SSB. One of these days I plan to visit their stations to see how they do the trick. After my sunset eighty meters sounded like twenty meters back home. The openings were just shorter and you had to carefully follow the grayline moving across Europe to make a successful call. But it was good to overcome the usual static crushes which sometimes were not bad at all. I just had to be there every day to hit the jackpot, I guess. Forty and thirty metres were always ready to serve as dependable work horses. During sunset and sunrise times these bands produced huge signals and nice pileups. The only negative thing was that those times were in great demand for 80 and 160, too, so I had to make a difficult choice every time as to where to go next. 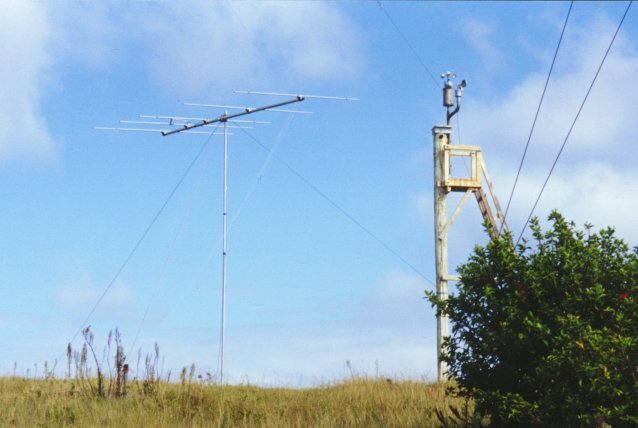 30 m signals had often a hollow sound and echo on them due to multi-path propagation. A beam antenna would have helped a lot. The most reliable DX bands were, of course, 20 and 17 m with BIG SIGNALS to all continents around Pitcairn midnight. 15 m was sometimes great fun as well. All these bands were capable of producing DX signals with polar flutter and fading indicating their path over the North Pole. As 15 m is my favorite band it is too bad that there was so much competition on operating time allotment among these three bands that 15 was often the looser. It did not deserve that fate, I believe. The real miracle bands, if six metres is not counted, were the ten and twelve metre bands. Consistent openings to Europe during practically every Pitcairn morning were soon to play an important part in my operating routines. The 10 m band was the only open band for most of the daylight hours which explains its high QSO count. It also seemed to be an endless source for USA contacts. 6m Yagi antenna in the position on the hilltop where the best contacts with JA and North America were made from. The Magic Band, six metres, was really pure magic this time. After a hasty conclusion one morning that the band was "stone dead" it suddenly opened up to produce big signals over the whole North American continent for the next two hours! The very same afternoon I enjoyed two straight hours of JA pileup. Another day, it was extremely exciting to copy the weak but readable signals coming almost from the antipode, Jordan, following calls from Israel, Cyprus, Malta and Spain. My signals were even heard in Germany and Switzerland! The Trans-Equatorial Propagation (TEP) produced stable signals from Central America almost every afternoon and from Hawaii every evening. And almost every afternoon the Beacon of the Canary Islands, Avelino EH8BPX, would give me a call from his mountain QTH. If I had had a six-metre addict as a companion DXpeditioner listening carefully on the 6 m band and making skeds with distant DXers, what would have been the results?! Even now, I managed to make over 700 contacts on six on the side of my HF DXpedition with modest 100W and a 5-element yagi @ 5 m.
I have written a full VP6BR Pitcairn DXpedition story for The DX Magazine, with Carl N4AA doing a great job as the Publisher and Chief Editor. Please visit the website at www.dxpub.com for subscription details. Learn more about the VP6BR Pitcairn DXpedition! 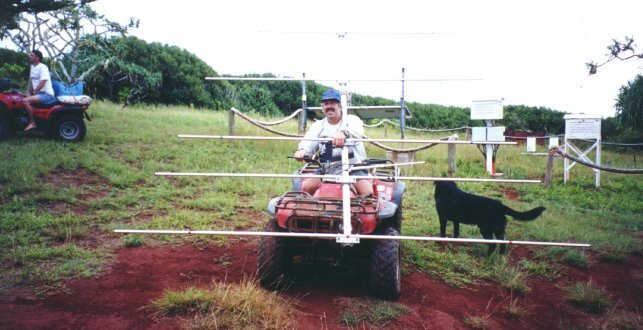 Good news: Pitcairn Island will continue to be available on Six Metres as the PA1ZX five element yagi donated by the UKSMG was left on the island. The Pitcairn Amateur Radio Club VP6PAC purchased one half of my ICOM IC-706MkII transceiver, the other half being donated by SMIRK. The necessary funds were raised in a few days, near the end of the DXpedition. The first users of this station are Tom VP6TC and Betty VP6YL who already have made their first ever QSOs on six metres. The QTH is their home in Adamstown approx. 100 m asl. They keep the radio on during the whole day and plan to regularly check in the 6 m monitoring frequency 28 885 kHz. You can find VP6BR Six Metre Story on UKSMG web page. Dave Brown VP6DB relocatting the 6m yagi on his motorbike to Tom's house. When one operates from a good location during good propagation an average station is all you need. A small linear amplifier with 400-600W output, dipoles for the low bands and trap beams for the higher bands is quite enough. This will guarantee nice contacts to all continents on all bands and lots of compliments for a good signal. The most important thing at site is to choose a position without any obstacles between your antennas and the horizon as well as one without any sources of local QRM. Just tune your antennas to resonance and fire a CQ call - the pileup is waiting for you!! I was sometimes so tired that I had to excuse the pileup to go QRT for some hours of sleep. But I had great fun all the time. I only hope that you in the other end of the pileup had as much fun as I had. I hope to see you soon on the band again from another location, and if we are lucky, at your local hamvention, too! It is now Sunday the 23th of January at 2125 local Pitcairn and ship time. We are coming closer to Pitcairn, and in the morning at 0400 there will be a wakeup call for all passengers as the ship will arrive at Pitcairn at 0500 local time on the 24th. I was just recently asked by the Chief Officer to take the antennas (15 and 10 m dipoles) down as it was still light outside and the stopping at Pitcairn will be a very short one just unloading the goods and passengers to the two Pitcairn longboats coming to meet us. So I am without any radio communication at the moment. The week in Auckland was very well spent in shopping with the help of Martin ZL1ANJ who spent all his week with me. This was a very generous act from him without which my DXpedition would have suffered enormously as I had to leave 14 kg of radio gear in Helsinki because of overweight problem. I bought again those things left behind plus many more new ones and took a new big suitcase full of stuff on the ship. I did some Dxing at Martin's QTH in Auckland during the week and more during the weekend at his country house 1 hours drive fm Auckland in a SUPER location. Elevation 270 m asl and overlooking the Pacific in three directions! We tested the station there and did some cable connections. Martin gave me four dipoles - for 10, 15, 40 and 80 m.
First two of these have been used on the container ship Queensland Star fed by single RG-58 feedline. I have received good signal reports with only 100W output from FT-1000MP. The reception has been my weak point as the noise level has been S7/8 on 15 m and S3/4 on 10 m. The reason for this is the ship's radar and other systems. Many motors run day and night in the reefer containers carrying fruits and vegetables to keep them in cold temperature. The dipoles for 40 and 80 will be used oin Pitcairn to see if they are efficient enough for DX work. Perhaps they are if my operating position will be up on the hill. I have worked 697 QSOs from ZL1 and 1647 QSOs as VP6BR/MM. Conditions have been changing from very good (even worked OH1XX on 10 m at 2230Z with 59 reports!) to poor especially during the daytime when bands have sometimes been very quiet. Yesterday and the day before I had QSOs with Dave VP6DB at VP6PAC and Tom VP6TC on 15 m. Reports were 59 both ways. The pitcairners onboard enjoyed chatting to their relatives waiting them on the island. Good PR for Ham Radio! Landing at Pitcairn Island. Longboats in the background. I hope to successfully land on Pitcairn and get all my equipment safely to the shore. Tomorrow evening there will be a celebration to greet the passengers most of whom are relatives of the islanders. On the ship there is also the new teacher and his wife and their 9-year daughter from Auckland coming for a 2-year term. The 8 day voyage on Queensland Star has been very most enjoyable because the weather has been good, the sea calm and the crew and passenger very amicable people. Only three days in the middle part of the voyage were overcast, rainy and misty. Otherwise it has been sunny and pleasantly warm. All is OK and I am in a very good mood. I have had a nice rest on the ship and some training with the pileups. The real adventure is just about to begin tomorrow!